What do you want from art? What do you think is the purpose of art ? Just as with other professions, the goal is knowledge and understanding, which can be shared with viewers. For me personally, art is about thinking, understanding, ability. This fascinates me with other professions as well. Can you explain this purpose further? Is it for enjoyment, edification, to provoke, challenge, inspire, motivate, surprise? To communicate – art for me is a form of communication. It is a universal language, because it works with metaphor, it does not describe. Art is an image, a reflection as it were, of human thought and emotion. What would you like for other people to experience when they stand before your works? Everyone interprets what they see in their own perspective, not that of the artist. It is like standing in front of a mirror. I want my work to speak to both the intellect and the emotions of viewers. I strive for a strong visual experience, deep and complex, yet also a clear message that needs no commentary. It occurs to me that through art we can perceive and feel fragments of the infinite contained inside each one of us. In these rare moments we are able to see something that goes beyond mere physical existence, something greater and sublime, which we might call beauty. The power of real art is in its ability to communicate without words, across time, space, cultures, and also the circumstances of its origin, and perhaps even to transcend meanings that the artist intended but could only subconsciously encode in his works. Do you think the interpretation must be singular? A single interpretation does not exist. Once my work leaves the studio I have to contend with public reaction, and that can be quite diverse. Most things one sees only in the context of a suggestion taken from somewhere else – that is why the context of the work is important, because it can point to things that are not obvious at first glance. Every artwork is a refutation of futility. Every human work is a manifestation of human thought – it is an imprint of a specific person, their efforts and actions – conscious as well as subconscious. Nothing happens casually or accidentally, but one needs time and distance to realise the meaning and significance of things. Creative work is fascinating. It has no ceiling and sometimes even no floor. Certain themes have been recurring for hundreds of years, but what is always fascinating is the authenticity in conveying the interpretation – the individual perspective on a thing. Do real works of art even need some kind of interpretation? If you share something about the source of inspiration with the public, then you can greatly speed up communication, or, rather, how people perceive the work, realising that what the artist knows intimately is at first entirely new to them, sometimes even strange. Interpretation is not a necessity, but it is enriching. A work without a viewer has no sense. It is precisely this interaction that turns it into a living thing. It is often said that time is essential for proving the value of a work and to show that it is not merely a fad connected to its moment in history. Time certainly brings objectivity, helps a person to see real connections, because it depersonalises it. Fads are a completely normal part of the art world. Every thing needs its flip side. Yet today’s art scene seems to have given up on permanence and credibility founded on truly lived experience, pursuit of “eternity” – qualities bound with art (but also music, architecture, literature …) of the past. Art is a reflection of its time. Non-professionalism, dilettantism, bouncing from one thing to another, lack of commitment, fecklessness? The possibilities today are endless – like a river where we can find everything imaginable. But this is no reason to succumb to skepticism. Each person chooses for themselves what they want, and they alone carry the responsibility for what they do and how they do it. Everyone has to find their own approach. The moment is everything, quick fame is the goal. How do you see this schism? There are a lot of things I do not have an opinion about, because I am trying to concentrate only on what I can influence myself, and trends and currents are definitely not among them. Do the works of Old Masters pulse with energy for you, or do you see them as “dead” and far from the modern man’s pursuit of feeling? They are a great challenge and motivation for me as well as a source of inspiration and edification. A large number of the works are as current as if they were made yesterday or today, even after hundreds of years. What determines the timelessness of a work is not when it was made but its message. In my working environment I am surrounded by the works of other artists, especially those from the Middle Ages. In my opinion it was precisely at this time that fine art reached its peak in many ways, and naturally a person measures their own work against what they think are the very best ones. A close friend of mine, who is in his 70s, once told me that I lead a dialogue with the dead through the artworks they have left behind. This is a privilege of the creative professions. Traces of artists remain even after their death. Life is unfair, the art world is unbalanced. If a person dies having created work just about themselves and for themselves, is it not a sign of idiosyncratic genius striding through time? The intellect is for a person to be able to orientate themselves. In the end, a person has the place that they have earned and deserve. The only reality is the one we live in. In my opinion, creative work has always been about dividing time between work in the studio and outside of it. Ignorance is, I think, more a sign of stupidity rather than uniqueness. Today’s conceptual art is often accompanied by extensive commentary. I suppose it is fine if an artist wants to write about their work, to inform and raise questions. Words can provide a broader context, but they can also get in the viewer’s way. The artist probably should not feel the need to explain everything or justify their work. Concise and intelligent writing enhances understanding of the work for the viewer and could be an introduction to the artist’s way of thinking. But if words are always needed to explain a piece of art, something obviously is not right. Exercising creative effort is a recognition of the fact that no one ever solves anything for the artist – it is about realising one’s own responsibility. Respect and esteem must be built; it is as long a process as the creative journey itself. Lately (I mean, roughly, for the past 20 years), it seems to me there has been a growing tendency towards something disturbing the sense of safety and certainty that humans crave. Your work seems to be a response to that threat, but maybe it is just my feeling. What exactly are your sources of inspiration? There are three main sources of inspiration. Literature, film and medieval art. If I had to choose three key artists, they would be Friedrich Dürrenmatt, Carl Theodor Dreyer and Matthias Grünewald. You exhibit with Richard Stipl quite regularly. Your drawings and his sculptures complement each other extraordinarily well and create a harmonious whole. How did this consonance originate, what was its genesis? It happened quite naturally. We were both born in the same town, Šternberk. Richard and I met when we were just 9 years old during his first visit to post-revolution Czechoslovakia; his parents had emigrated to Canada in 1980. So we have known each other for more than 20 years. But our joint work started only in 2012 with an exhibition in Istanbul. It was there that we realised our work complements and enhances the other’s. Since then we have come a long way. Today, we can speak of a creative symbiosis. We share a studio, and my ink drawings have now completely meshed with Richard’s sculptures. Can you tell me how your works originate – what is your process? At first there is always studying – the preparatory stage, a long process of gathering images and information. Only then do I start to make sketches, which are an essential part of my work. In my studio there are hundreds of them. It is these that I subsequently compose my drawing from. Some of them I then soak in a water bath. This is accompanied by a process of gradual layering that may recall a medieval palimpsest. My main medium is black ink on handmade paper. Recently, I started adding wood, both in the case of Richard’s sculpture and the wooden boards on which I have recently started to draw. It seems that the two dimensions of drawing are not enough and that you want to achieve a stronger effect by moving into the third dimension. What further departures from drawing do you see for your work? Drawing is key for me, it is essential to the entire body of my work. I see new horizons in stage design, installation, working with space. But also video, which can convey the content of my drawings to a wider audience, as with William Kentridge. 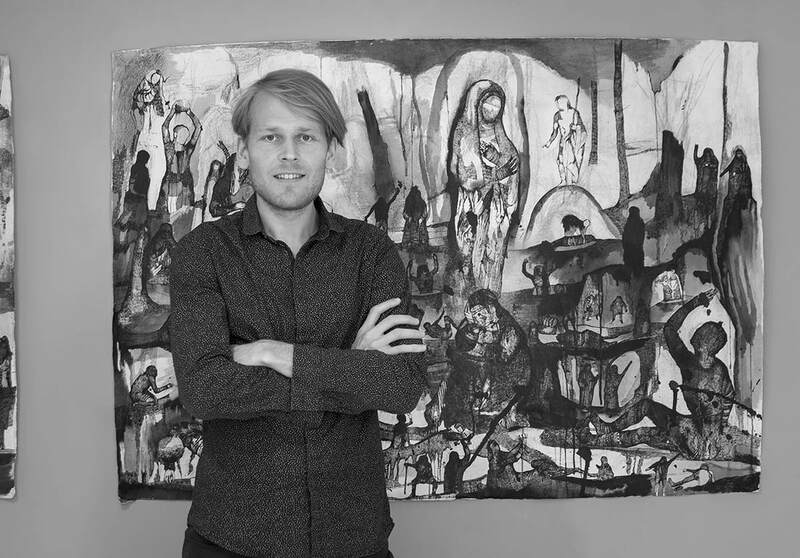 You are often exhibiting at prestigious international art fairs along with Richard Stipl. What kind of reactions are you receiving and how has the experience been for you? Contact with the public is vital. It is a mirror which moves a person forward intellectually. An artwork without an audience or interaction has no sense, in fact it does not really exist. I really value the opportunity of international contact. Every trip abroad brings my experience up a notch. I wish you much luck with this. Thank you for the interview.